Last year I experimented with recipes to combine the lightness of cake with the gooey yumminess of brownie. This year the tweak to the recipe is in the process! Here you go. Melt the butter and chocolate in a small saucepan, cook slightly. Whisk together the eggs, vanilla and coconut sugar, slowly fold in the chocolate (not too hot or you might slit the eggs) and lastly fold in the dry mix. Once lightly combined pour into a deep small baking tin which is lined with baking paper. Before popping in the oven at 190 / 170 fan press in rasberries. It should take 35 mins to cook through, you will see a few cracks form, take it out as it still cooks whilst out sitting. Cut up and store in an air tight container or eat the lot! I promised you the recipe and here it is! As many of you know I am studying Culinary Medicine with Nutritional Therapist, Author and TV chef Dale Pinnock - The Medicinal Chef. This allows me to follow up wellness coaching by designing recipes best suited to the needs of you and your family. I record my studies through Instagram (yes I bore people with pictures of food!) so I know the brownie recipe caught your eye. I have a vast library of healthy food books and work through 'alternative' recipe ideas, gradually adapting them for my family and also for those of you that might be gluten, diary or sugar free. The basis of this recipe comes from a book called A Modern Way to Cook by Anna Jones, a brilliant nutritionist and chef who worked in Jamie Oliver's team. 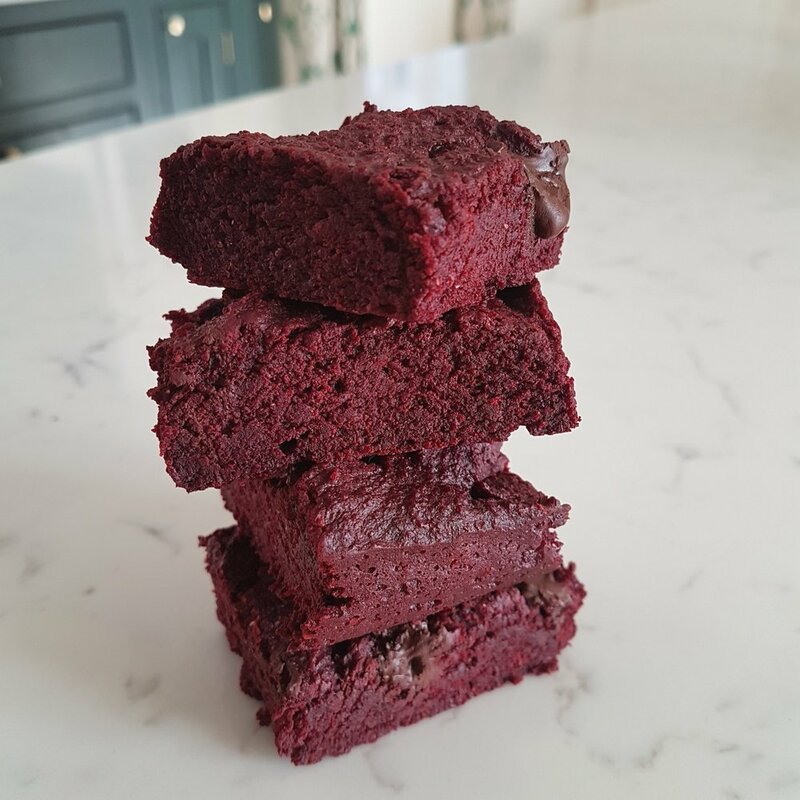 My husband does not want a brownie made of black beans, beetroot or sweet potato - all of which he has been subjected to, not delicious or even edible! and my daughter hates the taste of coconut so making a brownie that suits them all has been tricky!! Therefore, I will give you a few options that make this vegan and/or free from and I encourage you to change it up as you see fit. Whilst this is certainly a flourless, healthier option it does use real chocolate and tastes indulgent and naughty! Heat your oven to 180C and grease a tin (approx 20cm x 20cm) with coconut oil or unsalted butter and line with baking paper. If your tin is not this size just curl up the baking paper half way. If you are using chia seeds and not eggs you will need 3 tablespoons mixed with 9 tablespoons of water to form a gel. Pop a heatproof bowl over a simmering saucepan of water, breaking up the chocolate and mixing with the coconut oil or butter, stir until melted. Then stir in the coconut sugar followed by the eggs, one by one, or chia seeds and finally the vanilla, ground almonds and baking powder (most recipes would suggest that baking powder is only needed if using chia seeds but I also add when making this with eggs for extra lift). Just before pouring into the tray mix in half of the raspberries and pistachios. Bake for 30 minutes and rest for 20 mins - this is important, don't be greedy and force is out whilst still gooey! Chop into individual portions and store in an airtight container, they should keep for up to a week, top with extra fruit and nuts when serving.